Do not combine this page with any of the pages that contain both Sjöwall and Wahlöö, or with Per Wahlöö's individual author page. (See "Who Should/Shouldn't Get Combined" on the Author wiki page.) Thank you. Conversa Aquella parella de suecs de nom impronunciable. Martin Beck, el policia favorit dels suecs, i el nostre. Participants: Maj Sjöwall conversa amb Jokin Ibáñez i Lorenzo Silva. Moderador: Jordi Cervera. Maj Sjöwall grew up in one of the chain of hotels in Stockholm managed by her father. She was a 27-year-old journalist and art director, and a single mother with a small daughter, when she met Per Wahlöö, a prominent political journalist and former crime reporter nearly a decade her senior. They fell in love, moved in together, had two children, and talked about literature -- including the possibility of writing books together. 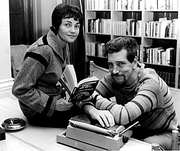 The result of their research and writing collaboration was Roseanna (1965), a detective novel featuring Martin Beck. It was the first in a series of 10 novels produced over 10 years. In 1971, The Laughing Policeman won an Edgar Award from the Mystery Writers of America and was adapted into a film. Maj and Per also wrote novels separately. Although they never married, their relationship lasted until his death in 1975. Maj Sjöwall is currently considered a "single author." If one or more works are by a distinct, homonymous authors, go ahead and split the author. Maj Sjöwall is composed of 6 names. You can examine and separate out names.